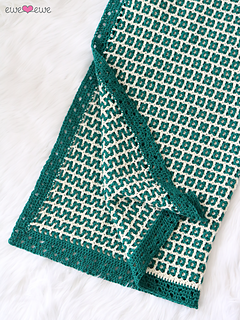 The Squared Away baby blanket features a fun-to-work interlocking crochet technique giving the finished fabric a thick, squishy feel. 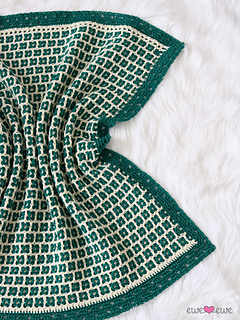 Choose baby’s two favorite colors of Ewe So Sporty yarn for a beautiful, washable finished piece. Notes: To complete this pattern, you will want to familiarize yourself with the interlocking crochet technique. Find out more about interlocking crochet from Tanis Galik’s book Interlocking Crochet and/or from her YouTube series. 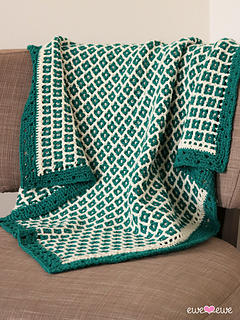 Some specific elements you will want to be comfortable with are working a row of mesh, double crochet in the front, double crochet in the back, dropping the B color, and uniting the edges.